With more customers shifting their operations to Liege airport, Wallenborn steadily expands locally to better serve our customers. 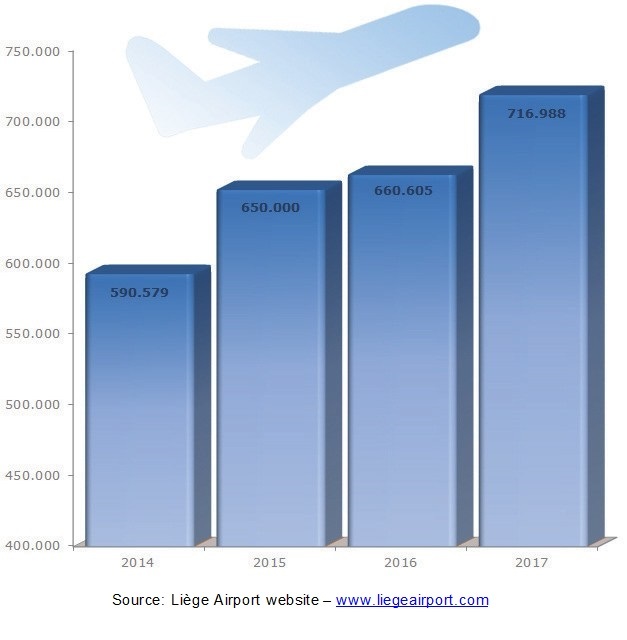 Liege Airport, the leading cargo airport in Belgium, had an exceptional year in 2017, setting an all-time record of 717,000 tonnes of goods handled with growth of 8.5%, compared to 2016. 2018 has showed no signs of this growth slowing down. Cargo business worldwide has seen overall growth, driven by strong economic performances in Europe, but also by the emergence of new e-commerce opportunities. All the Liege-based operators have made progress. In addition, three new airlines – Air China Cargo, Air Bridge Cargo and Turkish Cargo – have moved operations to Liege Airport. These new additions are proof that the airport's Flexpress strategy, which prioritizes cargo, is working. Liege Airport has accelerated its investment programme in order to support the growth of companies and handlers - a new 6,000 m2 cargo hall was put in operation earlier this year, and more than 20,000 m2 will soon be built, as well as 4 new parking stands for large aircraft which will be operational in 2019. It represents a major investment of more than 50 million euros in 2018 alone. As a result of this rapid growth, Wallenborn has adapted to support the ever increasing activity and customer requirements in Liege. Earlier this year, we added two new staff members to the local team. Last week, we permanently moved two of our trucks over which are now BE registered. These trucks will serve mainly domestic and nearby airports (MST & occasionally LIL), and will do so several times a day, as well as offering our customers flexible pre-loading and offloading. Donald Schaap, our Liege Operations Manager, noted: "As cargo volumes keep on increasing in Liege, we need to find ways not only to maintain service levels throughout this intense growth period, but also to differentiate ourselves. Therefore, one more staff member will be added in September, bringing our total local headcount to 5 employees. A third truck will also be added, with drivers operating the trucks in 12h shifts to increase domestic capacity and flexibilty 24/7. These additions should put us in a good position to take on the high season challenge that is Q4, and meet the needs of our customers." These latest developments are in line with Wallenborn's customer focus value and principle to grow with our customers. To learn more about how we can support you in Belgium, please contact Donald and his team on + 32 4 235 81 50 or LGG.request@wallenborn.com. Liege Airport, 8th cargo airport in Europe and 1st in Belgium, is the only European airport that prioritises full cargo. It specialises in express transport, electronic commerce, pharmaceutical products and perishable goods, as well as live animals. Liege Airport, and its brand Flexpress, is operational 24/7 without restrictions, offering a flexible and fast service, all less than a day’s journey by truck to the heart of the Amsterdam-Paris-Frankfurt golden triangle with its 400 million consumers. To learn more visit www.liegeairport.com.